The Letter (1940), starring Bette Davis, is this week's Noir Alley selection. There's several great films noir airing this week on TCM. The lineup includes two from director Orson Welles (Touch of Evil and The Lady from Shanghai), an Alfred-Hitchcock masterpiece (Strangers on a Train), and an iconic Bette Davis performance (The Letter). Note: All times are ET and the highlighted text has links to full-length articles. Here's a link to the complete schedule from May 28-June 3. TCM is honoring the legendary entertainer with a morning lineup of his movies (he was born Leslie Hope on May 29, 1903, in Eltham, England).. The best bets are the hilarious screwball comedy/noir My Favorite Brunette (1947) at 7:45 am Tuesday and the penultimate Road movie with Bing Crosby and Dorothy Lamour, Road to Bali (1953) at 1 pm. Groucho Marx, Sig Ruman, and Magaret Dumont in A Night at the Opera (1935). TCM is rounding out Tuesday's daytime lineup with two hilarious films from the Marx Brothers: A Night at the Opera (1935) at 4:45 pm and the underrated Room Service (1938) at 6 pm. 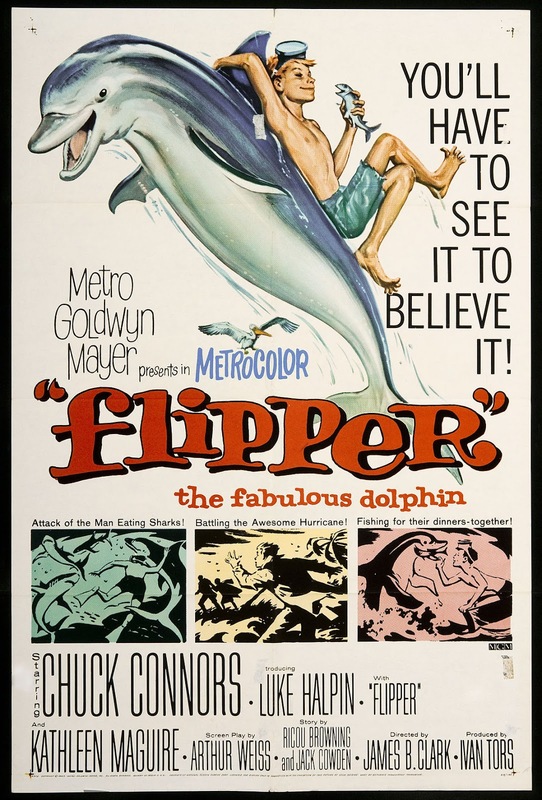 TCM wraps up its spotlight on classic movie series this week with mysteries and animal stars. 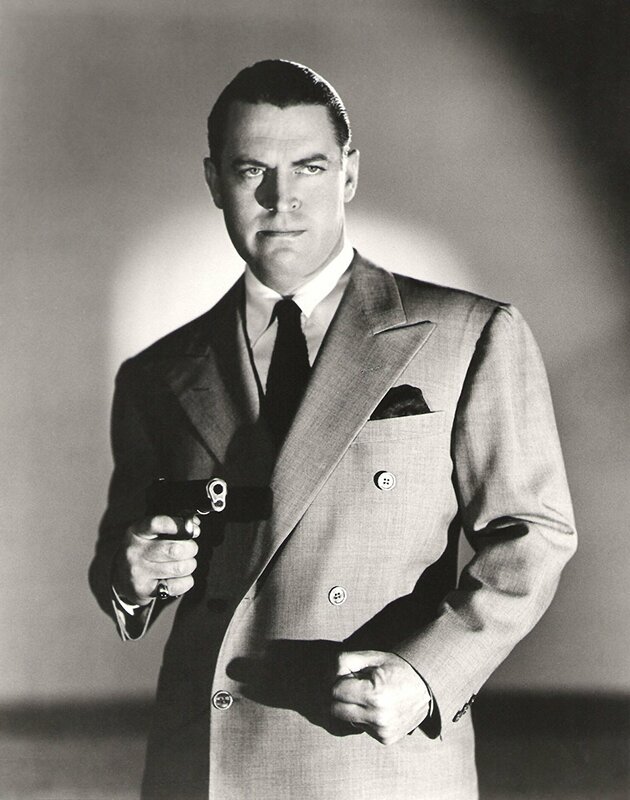 First up is Chester Morris as detective Boston Blackie who is an "enemy to those who make him an enemy, a friend to those who have no friend." Morris played Boston Blackie in 14 films; TCM is airing five of these movies starting with Meet Boston Blackie (1941) at 8 pm Tuesday and ending with After Midnight with Boston Blackie (1943) at 1 am. 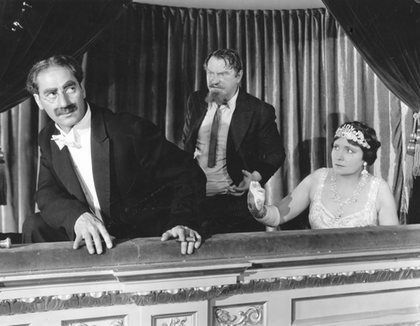 The late night lineup features three mysteries starring "gentleman adventurer" Bulldog Drummond. The character created by English writer H.C. McNeile was played by several actors. Ronald Colman's first sound film was Bulldog Drummond (1929) at 2:15 am, while Ralph Richardson took over the role for The Return of Bulldog Drummond (1934) at 4 am. Finally, Ray Milland got a chance with the character in Bulldog Drummond Escapes (1937) at 5:15 am. 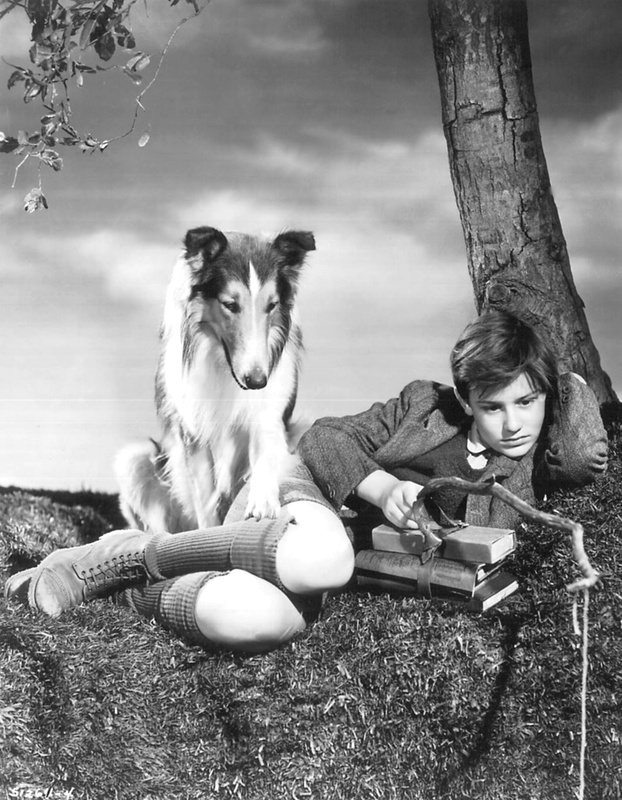 Lassie and Roddy McDowall in Lassie Come Home (1943). The Bulldog Drummond movies continue in the morning with three more films: John Lodge plays the title character in Bulldog Drummond at Bay (1937) at 6:30 am Wednesday. John Howard takes on the role for the next two films, Bulldog Drummond Comes Back (1937) at 8 am and Bulldog Drummond's Revenge (1938) at 9 am. The great John Barrymore plays Drummond's Scotland Yard sidekick in the final two films. The rest of the daytime lineup is devoted to suave crimefighter Simon Templar aka The Saint. Many people are familiar with the sixties TV series starring Roger Moore, but RKO Pictures made eight Saint films in the 1930s and 1940s. TCM is airing all of them starting with the first film The Saint in New York (1938), which stars Louis Hayward. George Sanders took over the role for five movies starting with The Saint Strikes Back (1939) at 11:15 am and ending with The Saint in Palm Springs (1941) at 4:15 pm. 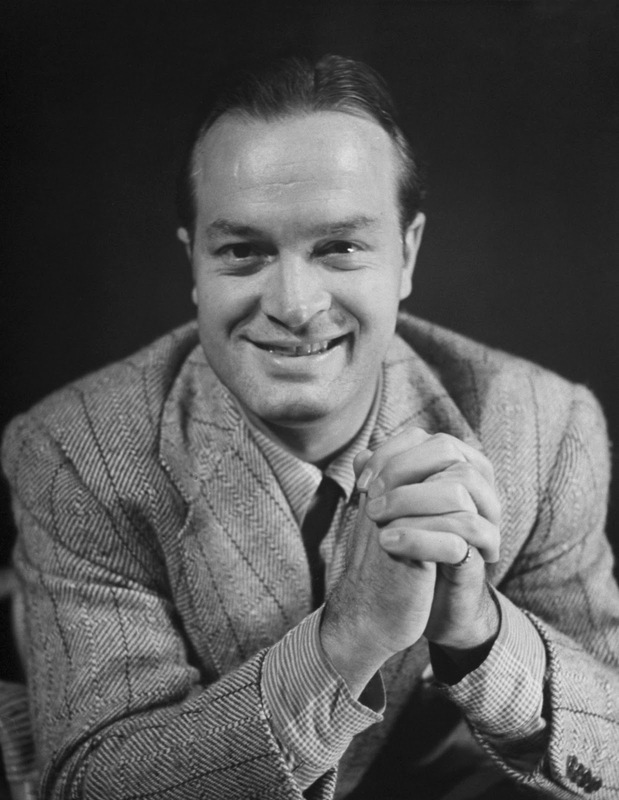 Hugh Sinclair played The Saint for the final two films: The Saint's Vacation (1941) at 5:30 pm and The Saint Meets the Tiger (1943) at 6:45 pm. The prime time and late night lineup feature six Lassie movies. The evening starts with Lassie Come Home (1943) at 8 pm and ends with Challenge to Lassie (1949) at 5 am. The animal adventures continue with the Lassie Western The Painted Hills (1951) at 6:30 am. Next up are seven films in the Rusty series about a young boy (Ted Donaldson) and his faithful German shepherd. The lineup stars with Adventures of Rusty (1945) at 7:45 am and ends with Rusty's Birthday (1949) at 3:15 pm. 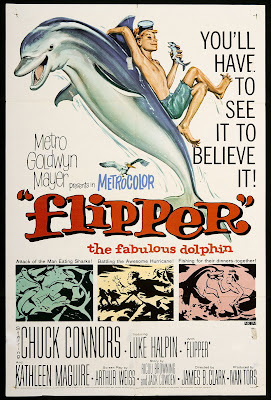 Finally there's two films starring everyone's favorite dolphin: Flipper (1963) at 4:30 pm and Flipper's New Adventure (1964) at 6:15 pm. 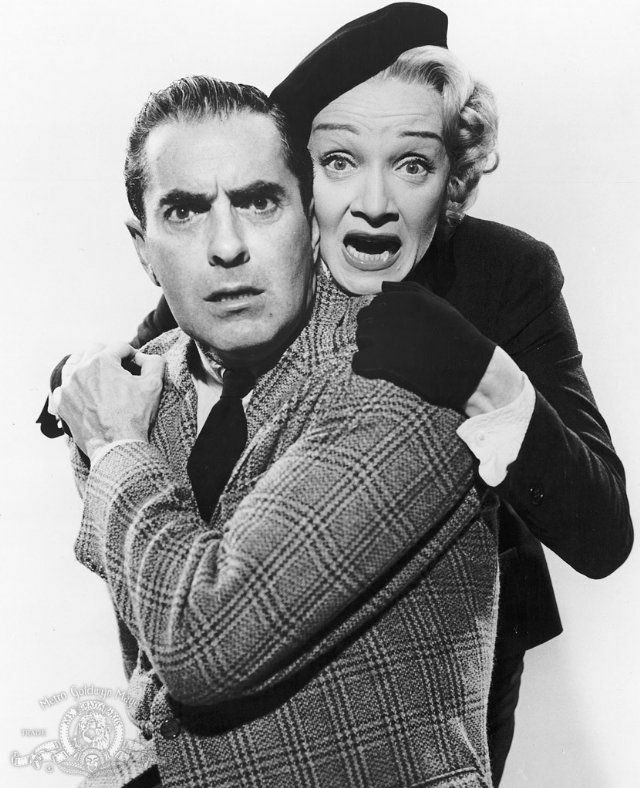 Tyrone Power and Marlene Dietrich joke around in this publicity still for Witness for the Prosecution (1957). Touch of Evil (1958) at 8 pm: Dietrich has what amounts to a glorified cameo as a wisecracking madam in director Orson Welles' noir masterpiece about police corruption and the drug trade on the U.S.-Mexico border. Witness for the Prosecution (1957) at 10 pm: Dietrich gives one of her best performances as the wife of an accused killer (Tyrone Power) in this Agatha Christie adaptation directed by Billy Wilder. 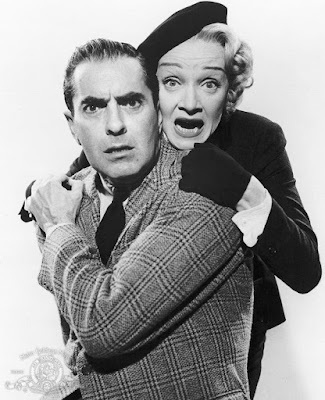 Stage Fright (1950) at 12:15 am: La Dietrich meets the master of suspense in this Alfred Hitchcock-directed thriller about a drama student (Jane Wyman) who investigates the murder of the husband of a famous actress (Dietrich). Not quite top-drawer Hitchcock, but still fairly great; Dietrich's big number, "The Laziest Gal in Town" and the supporting cast (Alastair Sim alert) make this one more than worth watching. Rancho Notorious (1952) at 2:15 am: Nobody ever mentions it, but Dietrich was one of the great Westerns stars; she is wonderful as the queen of the bandits in this revenge film costarring Arthur Kennedy. The Monte Carlo Story (1957) at 4 am: Dietrich plays a gambler on the make who romances Vittorio De Sica and Arthur O'Connell in the French Riviera. The beautiful scenery and Dietrich's sultry rendition of "Back Home in Indiana" make this one worth a watch. 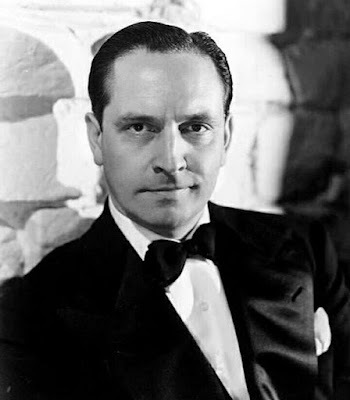 TCM is airing a sensational lineup of films from this versatile actor, including both of his Academy Award-winning roles: Victorian scientist/madman in the pre-code version of Dr. Jekyll and Mr. Hyde (1932) at 11 am and as a returning World War II veteran in The Best Years of Our Lives (1946) at 6 am. There's also two wonderful costume dramas: March plays poet Robert Browning in the lovely biopic The Barretts of Wimpole Street (1934) at 9 am and the title character in the lavish adaptation of the picaresque novel Anthony Adverse (1936) at 2:45 pm. March starred in two of the best screwball comedies ever made: Opposite Carole Lombard in Nothing Sacred (1937) at 5:15 pm and Veronica Lake in I Married a Witch (1942) at 6:30 pm. Finally, March has a great character part as a grasping corporate vice president in the drama Executive Suite (1954) at 12:45 pm. Peter Lorre, Geraldine Fitzgerald, and Sydney Greenstreet in Three Strangers (1946). Three Strangers (1946) at 8 pm Saturday and Strangers on a Train (1951) at 10 pm: The first film is a taut little noir from the pen of director John Huston. 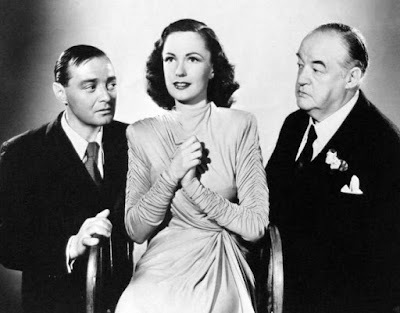 It stars Geraldine Fitzgerald, Sydney Greenstreet, and Peter Lorre as three strangers who agree to split the winnings on a horse-racing bet; because this is noir, things don't go exactly as planned. Three Strangers is part of a night of movies about "stranger danger" that includes director Alfred Hitchcock's classic noir, Strangers on a Train (1951) at 10 pm. 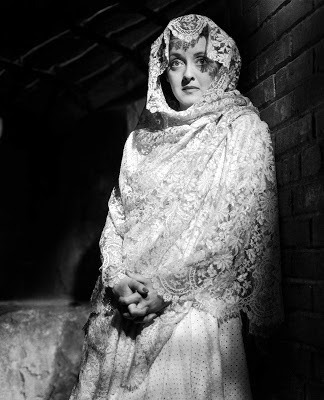 Bette Davis in the opening scene of The Letter (1940). The Letter (1940) at midnight Saturday night/Sunday morning and 10 am Sunday: This Southeast Asia-set thriller from director William Wyler and star Bette Davis is about Leslie Crosbie (Davis), a woman who murders her lover (David Newell) while her rubber planter husband (Herbert Marshall) is away. A tour de force performance by Davis, who is more than ably supported by Marshall, James Stephenson as Leslie's skeptical attorney, and Gale Sondergaard as a vengeance-filled wife. Wyler's exceptional direction and Tony Gaudio's moody cinematography are second to none. 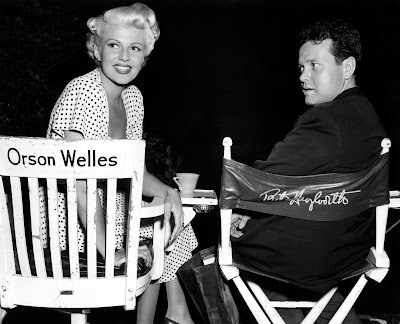 The Lady from Shanghai (1948) at 8:15 am Sunday: A bleach-blonde Rita Hayworth and her soon-to-be ex-husband Orson Welles set in each other's chairs on the set of this classic noir. James Garner and Julie Andrews in The Americanization of Emily (1964). 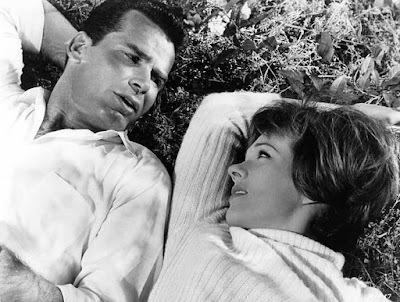 Songbird Julie Andrews and tough guy James Garner made two films together (they also appeared in a made-for-TV Christmas movie). TCM is airing both of them on Sunday starting with romance/war satire The Americanization of Emily (1964) at 8 pm, which features Garner as a cynical Naval officer stationed in Great Britain during World War II who falls for his spunky driver (Andrews). The gender-bending musical Victor/Victoria (1982) at 10:15 pm finds Andrews playing a "female impersonator" in the 1930s who falls for a Chicago gangster played by Garner. 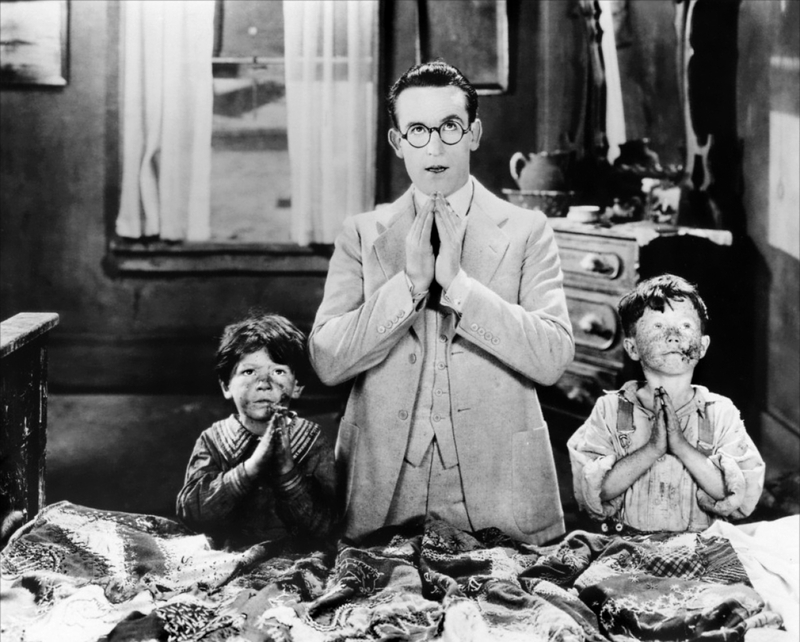 For Heaven's Sake (1926) at 12:45 am Sunday night/Monday morning: Comedian Harold Lloyd plays a go-getter who takes up mission work to impress a young woman (Jobyna Ralston). The final chase through the streets of Los Angeles is still a hair-raiser. Director Roberto Rossellini and Ingrid Bergman while making Stromboli (1950). This week's TCM imports features two films from the old Hollywood icon. First is the Swedish film A Woman's Face (1938) at 2 am Sunday night/Monday morning, which was later remade into a gripping noir starring Joan Crawford. The Italian film Stromboli (1950) at 4:15 am, about a refugee who marries a gruff fisherman (Mario Vitale) to escape life in an internment camp. 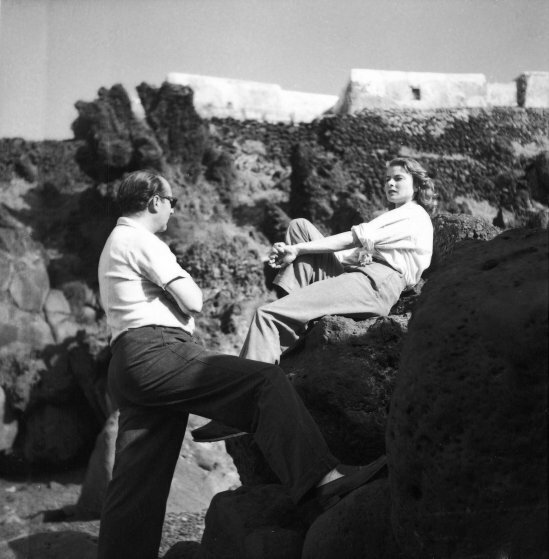 This is the first film Bergman made with her future husband, director Roberto Rossellini. Just strap me in a chair and put on TCM! Some of those highlights, particularly The Letter lead me to an evangelistic fever in getting "newbies" in front of the screen. I hope people take note of the wonderful performance by Victor Sen Yung in that film. Had times been different, he should have received at least an Oscar nod. The more I see of Victor Sen Yung the more I am impressed with him.